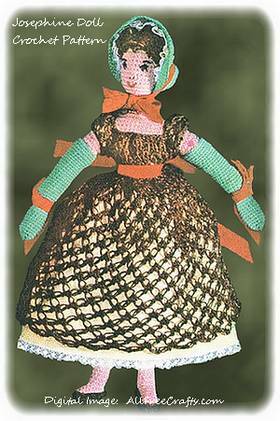 Beautiful free vintage crochet pattern to make a detailed Empress Josephine doll. This vintage crochet pattern for Josephine was first published in Coats and Clark’s Quick Tricks in Crochet, Book No. 293, along with a Crocheted Cowboy Doll and Crocheted Ballerina. No explanation was given for the doll’s origin or history, but the name and the costume undoubtedly commemorate Her Imperial Majesty, The Empress of the French, Josephine de Beauharnais. Josephine’s love affair and marriage to Napoleon are legendary. She was also known for her love of roses, hiring horticulturist Andre Dupont, who began modern hybridization of roses through controlled pollination. J. & P. COATS “KNIT-CRO-SHEEN,” Art. A. 64, 2 balls of Beauty Pink and 1 ball each of No. 131 Fudge Brown and No. 76 Robinette. A few yards of Black, Blue and Red Embroidery Floss for eyes and mouth. 2 yards of red grosgrain ribbon, 1/2 inch wide … 1 yard of white lace … 1/4 yard of yellow material for petticoat … Cotton batting for stuffing … A feather … 2 snap fasteners …Beads. NECK … With Beauty Pink and No. 4 hook, ch 8. 1st rnd: 3 sc in 2nd ch from hook, sc in each ch across, 3 sc in last ch; working along opposite side of starting chain make sc in each ch across. 2nd rnd: Sc in each sc around. Repeat the 2nd rnd until neck measures 5/8 inch. To Shape Body: 1st rnd: Sc in each sc, increasing 4 sc evenly around – to inc 1 sc, make 2 sc in 1 sc. 2nd to 8th rnds incl: Sc in each sc, increasing 3 sc evenly on each rnd. 9th to 19th rnds incl: Sc in each sc, decreasing 2 sc on eac rnd – to dec 1 sc, work off 2 sc as 1 sc. HIPS … 1st to 7th rnds incl: Sc in each sc, increasing 3 sc evenly on each rnd. 8th to 12th rnds incl: Sc in each sc around. 13th to 18th rdns incl: Sc in eac sc, decreasing 1 sc on each rnd (34 sc on last rnd). Break off. Stuff Hips firmly with cotton batting. Divide remaining sts on last rnd in half for legs. LEG … Attach thread, sc in each sc around one leg opening, sc in eac sc around until leg measures 2¼ inches. Dec 1 sc on every other rnd until 12 sc remain. Work without decreasing until leg measures 4¾ inches. Break off. Stuff leg firmly with cotton batting. Work other leg to correspond. FOOT (Make 2) … 1st rnd:Ch 2, 6 sc in 2nd ch from hook. 2nd rnd: 2 sc in each sc around. Work without increasing until work measures 7/8 inch. Now work in rows as follows: 1st row: Dec 1 sc, sc in next 3 sc, dec 1 sc. Ch 1, turn. 2nd row: Dec 1 sc, sc in next sc, dec 1 sc. 3rd row: Work off last 3 sc as 1 sc. Break off. Stuff Foot firmly with cotton batting. ARM (Make 2) … 1st rnd: Ch 2, 6 sc in 2nd ch from hook. 2nd rnd: 2 sc in each sc around. Work without increasing until piece measures 1 inch. Dec 1 sc on next rnd. Work without decreasing for 1 rnd. Inc 2 sc on next rnd. Work without increasing until piece measures 1¾ inches. Sc in each sc around, increasing 1 sc every 3/4 inch until piece measures 4¼ inches in all. Now work in rows as follows: 1st row: Dec 1 sc, sc in next 5 sc, dec 1 sc. Ch 1, turn. 2nd row: Dec 1 sc, sc in next 3 sc, dec 1 sc. Ch 1, turn. 4th row: Work off last 3 sc as 1 sc. Break off. Stuff Arm firmly with cotton batting. HEAD … 1st rnd: Ch 2, 6 sc in 2nd ch from hook. 2nd rnd: * Dec 1 sc, sc in next sc. Repeat from * around. Now dec 6 sc evenly on each rnd until 6 sc remain. Break off. Stuff Head firmly with cotton batting. Sew up opening. Sew Head, Arms and Feet in place. Sc in 2nd ch from hook, * (draw loop on hook out to measure 3/8 inch, thread over and draw loop through, insert hook between single and double loops and draw a loop through, thread over and draw through 2 loops on hook – knot st made – make another knot st, skip 1 ch, sc in next ch) twice; make 2 knot sts, sc in next ch. Repeat from * across. Make 2 knot sts. Turn. 2nd and 3rd rows: * Sc under double loop of next knot st to the right of knot, sc under double loop of next knot st to the left of same knot, make 2 knot sts. Repeat from * across. Make 2 knot sts, turn. Do not turn at end of 3rd row. Sl st in center of next knot st. Now work in rnds as follows: 1st rnd: * Make 2 knot sts, sc in next 2 knot sts. Repeat from * around. Do not join at end of rnd. Repeat first rnd until Skirt reaches doll’s ankles. Join and break off. BODICE … Attach Brown to first ch on opposite side of starting chain of Skirt. 1st row: * Make 2 knot sts, skip 1 ch, sc in next ch. Repeat from * across. Make 2 knot sts, turn. 2nd and 3rd rows: *Sc in next 2 knot sts, make 2 knot sts. Repeat from * across. Make 2 knot sts, turn. 4th row: * Sc in next 2 knot sts, ch 3. Repeat from * across, ending with sc in last 2 knot sts. Join and break off. SLEEVE (Make 2) … With Brown, ch 20. 1st row: Sc in 2nd ch from hook, * make 2 knot sts, skip 2 ch, sc in next ch. Repeat from * across. Make 2 knot sts, turn. 2nd and 3rd rows: Repeat 2nd and 3rd rows of Bodice. 4th row: * Sc in next 2 knot sts, ch 2. Repeat from * across, ending with sc in last 2 knot sts. Break off. Sew Sleeves in place. Sc closely around neck and sleeves, drawing in to fit. Place ribbon around waist and tie in a bow. SLIPPER (Make 2) …Starting at center with Brown, ch 8. 1st rnd: 3 sc in 2nd ch from hook, sc in each ch across, 3 sc in last ch; working along opposite side of starting chain, make sc in each ch across. 2nd and 3rd rnds: Sc in each sc around, increasing 3 sc evenly on each end. 4th rnd: Sc in each sc around. Join in back loop of first sc. 5th rnd: Ch 3, picking up back loop only, dc in each sc around. Join to top of ch-3. 6th rnd: Dec 1 sc, sc in next 2 dc, dec 1 sc, sc in each remaing dc around. Join and break off. GLOVE (Make 2) …Starting at top of Glove with Robinette and No. 7 hook, ch 24. Join with sl st. 1st rnd: Sc in each ch around. 2nd to 5th rnds incl: Sc in each sc around. 6th rnd: Sc in each sc, decreasing 4 sc evenly around. 7th to 23rd rnds incl: Repeat 2nd rnd. 24th rnd: Repeat 6th rnd. 25th rnd: Repeat 2nd rnd. 26th rnd: Sc in each sc, increasing 4 sc evenly around. 27th to 37th rnds incl: Repeat 2nd rnd. 38th rnd: Sc in each sc, decreasing 6 sc evenly around. 39th rnd: Sc in each sc, decreasing 7 sc evenly around. Break off, leaving a 10-inch length of thread. Thread through remaining sts, pull up tightly and fasten securely. BONNET … Starting at center with Robinette and No. 7 hook, ch 2. 1st rnd: 6 sc in 2nd ch from hook. 2nd rnd: 2 sc in each sc around. 3rd rnd: * 2 sc in next sc, sc in next sc. Repeat from * around. 4th and 5th rnds: Sc in each sc, increasing 6 sc evenly around. Join in back loop of first sc. 6th rnd: Picking up back loop only, sc in each sc around. 7th rnd: Working through both loops, sc in each sc, increasing 3 sc evenly around. 8th to 11th rnds incl: Sc in each sc around. 12th rnd: Repeat 7th rnd. 13th rnd: Repeat 8th rnd. BRIM … 1st row: Ch 1, 2 sc in each sc across to within last 7 sc. Ch 1, turn. 2nd to 10th rows incl: Skip first sc sc in each sc across. Ch 1, turn. Work short rows as follows: 1st to 6 rows incl: Skip first sc, sc in each sc across to within last 3 sc. Ch 1, turn. Sc closely around edge of Brim and back of Bonnet. Join and break off. HAIR … With double strand of Brown and No. 4 hook, work as for Head until 5 rnds have been completed. Join and break off. With right side facing, insert hook through any sc on 5th rnd to base of same sc, and, working over sc draw loop through, thread over and draw loop through on hook, draw loop on hook out to measure 1/2 inch (loop st made); retaining all loops on hook, insert hook in next sc, draw thread through, thread over and draw through loop on hook, then draw loop on hook out to measure same previous st. Make a loop st in each st around. Break off. Work 2 more rnds of loop sts in same manner. Break off. Sew Hair to Head. Arrange first row of loops to form bangs and tack in place. FINISHING DOLL: Trim Bonnet with lace, ribbon, and feather. Stuff back of bonnet. tie on bonnet. Emroider face. Place beads around neck. Make a petticoat with yellow material and sew lace around bottom. Place ribbon around wrists. Sew snap fasteners in place.